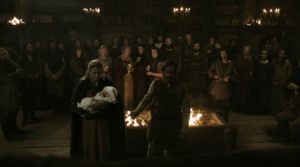 A scene in the History Channel series Vikings: a man and a woman with a small infant come before the shield-maiden Lagertha (acting as Earl) for justice. The man complains that after many years in which they were unable to have children together, the woman, his wife, became pregnant by a young man who came to their house; he wants her to be punished for her infidelity. Lagertha replies that the young man was clearly the god Heimdall in disguise, and that the husband should give thanks for his good fortune. The man complains: that’s just a story! Lagertha replies: our whole lives are just stories. It’s a virtuosic display of judgement: by attributing an ad hoc sexual encounter, which has resolved the problem of childlessness between the couple, to the visitation of a god, Lagertha encourages everyone involved to accept and take advantage of the situation. “Ancient stories” about gods who frequently do unexpected things, disrupting the lives of mortals, provide a symbolic framework for dealing with chance and contingency, and a rationale for bending the rules when things don’t go as planned. 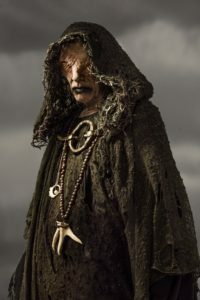 The society of the Vikings is repeatedly shown to be one which values surprises: narratives are for twisting, and the most effective actor in such a society is the one who knows how to break out of a deadlocked situation with a flourish of (often brutal) improvisation. It both is and is not true that our whole lives are “just stories”. Lagertha is able to make this assertion because she is in a position of authority, backed by the threat of violence: it would be unwise to cling to a position of obstinate literal-mindedness in the face of her judgement. The prerogative of suspending the reality principle, of demanding collusion in a shared fiction, belongs to those who are in a position to exercise priestly or shamanic symbolic power. Literal-mindedness appears “obstinate” because it is a counter-power, an obstacle to collective confabulation. The story-makers will always construe this as wilful, because from their perspective which story you choose to abide by is ultimately a matter of will. If you want to let slip a defiant eppur si muove, you had better do so under your breath. Our lives are stories inasmuch as our subjective and social experience is mediated through narrative, and subject to symbolic power. The most widely-accepted contemporary answer to the problem of symbolic power being concentrated in the hands of dominant social groups is to insist on “telling our own stories” in retort, taking control of the reins of narrative, becoming shamans of our own lives. Considerable political value is attached to symbolic creativity, subversive meaning-making, magical practices which challenge the power of mainstream narratives which devalue marginalised lives and experiences. At the same time, our lives are not stories, or not wholly stories: to be obstinately literal-minded about it, Heimdall isn’t real. The statement that Heimdall isn’t real isn’t a statement about which stories we should live by, or whose symbolic authority ought to hold sway, but about what exists or doesn’t exist. We try to determine whether or not such a statement is valid not by considering whose narrative it supports, but by working out its ramifications to see whether they are coherent, and reality-testing to see whether or not it holds true. Isn’t such literal-mindedness missing the point, somehow? I picture an interlocutor saying “yes, we know – we’re not idiots – but: shut up”. Because collusion in shared fictions is what sustains the social bond, what motivates collective political action, and there is no way for either of these things to happen purely based on assertions about what does or doesn’t exist; because statements of fact are inextricably tangled up with espousals of value, and investigation into facts is always framed within a social context; and so on. As true as all of that is, it will never be enough to make Heimdall real instead of not real. Symbolic power is exercised over and against a reality that stands in its way; that, in a sense, is what makes it power. It is only by “missing the point” that everyone wishes us to see and assent to that we are able to force the point – that things are either thus and so, or not thus and not so, and that our lives are no longer “just stories” to precisely the extent that we make this the basis on which we choose what to believe.